We have developed a robust Roustabout/Rig Helper and Roughneck training courses. The structure of the courses is based on what oil and gas companies are looking for in roustabouts and roughnecks. A career as Roustabout / Rig Helper can be very rewarding. Qualified and competent Roustabouts / Rig Helper professionals are sought after around the world. 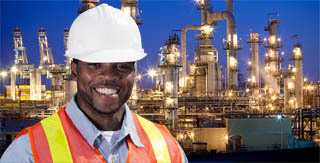 And the oil and gas industry in Nigeria has a large demand for Roustabout / Rig Helpers and Roughnecks. Why become a professional Roustabout / Rig Helper? It is an entry level job so it provides an easy entry into the industry.